The entire beginning of the movie – all with close-up, shaky-cam shots – is that random jumping from unknown character to unknown character; racial injustice here, violence there, chaos everywhere. Perhaps the point of the beginning of the film was to make the audience feel that uncertain chaos, but what it really needed was a stable point of view to watch from. 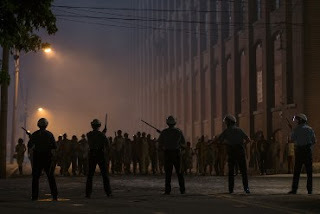 Eventually we got that – a singular point in time during the 1967 Detroit race riots with characters whom you understand where they are coming from. A young, black Motown group was just starting up – called the Dramatics – and had their first major gig. Almost had their first major gig until the concert hall was evacuated because a curfew was enacted, because, you know, Detroit in 1967. The rioting was very severe at this point. Larry (Algee Smith) and friend Fred (Jacob Latimore) find refuge at the Algiers Motel with two flirtatious white girls (Hannah Murray and Kaitlyn Dever). But that refuge ends when one of the girls’ black friends decides to fire a blank from a starter gun. The motel is stormed by police and the resulting stand-off (or more accurately described as racist police one-upmanship and black kids stuck in a nightmare reality) is tense. The Detroit city police force is led by Krauss (Will Poulter) who is one of the most racist assholes you will ever see. He has no problem shooting unarmed black men point blank from behind because presumably they have committed some crime worthy of death. The interesting aspects as to how this gruesome display of police terrorism unfolded, is how the other (mostly white) cops responded. Many of the city cops with Krauss just followed his lead – partly out of fear (could he go so far as to shoot them? Probably) and partly from the systemic racism. Some have the clear sense that this is wrong, but they don’t know it’s wrong because the racist behaviour just gets reinforced. Then there are state cops who do know factually that this is wrong, but don’t care enough to risk getting caught up in the political ramifications. The majority of the film is that marvellously taut and excruciatingly interesting Algiers beatings and shootings. Then the film moves onto the trial. Some critics find this is the only place the film suffers from Bigelow switching gears trying to show both systemic racism in society and follow a traditional courtroom drama, but structural and thematic issues with the film follow from that point. Taking a page from Spielberg, Bigelow goes for every possible emotional ending. From the trial’s conclusion to a father crying about his dead son to a victim struggling with his life – it just dragged out the ending for an already heavy-hitting film. Most of Detroit’s brilliance lies in the fear it creates – not just that this can happen again, but that it has and is still happening. It offers a number of view points to see what has changed and what hasn’t and hopefully from there people can fight to end this senseless violence.